Remember that retirement commercial with the huge million dollar (and more) numbers weighing down over peoples’ heads? In real life, those numbers really do weigh down on people. In real life, the weight is so great, folks would rather go into full ostrich mode rather than confront the reality of their own retirement. And that’s too bad, because preparing for you retirement is not as onerous as that commercial implies. There’s a smaller, mathematically equivalent number that’s much easier for folks to chew. In fact, once presented with this number number, people approach saving for their retirement with more enthusiasm if not outright zeal. How does Chris Carosa know? Because he’s seen this happen in real life. He’s been there when employees walk into a 401k education meeting with the weight of the world on their shoulders. He’s watched as, when presented with the same facts from a different perspective, these 401k investors’ dour expressions transform into broad self-satisfied smiles. And now he’s put that same magic into a small, easy-and-enjoyable-to-read book. Click here to read more about what you’ll discover in Chris Carosa’s Hey! What’s My Number? 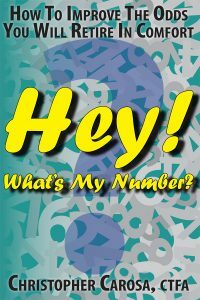 Would you like to benefit from reading Chris Carosa’s Hey! What’s My Number? anytime you want? Click here to purchase the Chris Carosa’s Hey! What’s My Number? directly from Amazon. Click here to purchase the Chris Carosa’s Hey! What’s My Number? directly from Barnes & Noble. Click here to purchase the Chris Carosa’s Hey! What’s My Number? directly from The Book Depository (free delivery worldwide). Click here to purchase the Chris Carosa’s Hey! What’s My Number? directly from CEO Read for bulk orders (when available). Click here to purchase the Chris Carosa’s Hey! What’s My Number? at your nearest retail outlet. A Pizza The Action is a business book wrapped in a personal memoir. Join the author as he relives real-life events that occurred while he worked in his grandparents’ pizza stand at the nation’s largest county fair. Chris Carosa explains how, in retrospect, these stories revealed 15 rules told through 54 lessons all entrepreneurs, business executives and anyone interested in getting ahead must know. Click here to read more about what you’ll discover in Chris Carosa’s A Pizza The Action. Would you like to benefit from reading Chris Carosa’s A Pizza The Action anytime you want? Click here to purchase the Chris Carosa’s A Pizza The Action directly from Amazon. 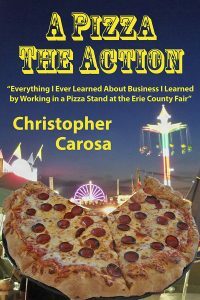 Click here to purchase the Chris Carosa’s A Pizza The Action directly from Barnes & Noble. Click here to purchase the Chris Carosa’s A Pizza The Action directly from The Book Depository (free delivery worldwide). Click here to purchase the Chris Carosa’s A Pizza The Action directly from CEO Read for bulk orders (when available). Click here to purchase the Chris Carosa’s A Pizza The Action at your nearest retail outlet. 50 Hidden Gems of Greater Western New York – A handbook for those too proud to believe “wide right” and “no goal” define us. Discover the secrets in your own backyard! Written in Chris Carosa’s usual light-hearted and entertaining style, 50 Hidden Gems of Greater Western New York reveals some of the most delicious and underexposed treasures the region offers. 50 Hidden Gems of Greater Western New York takes you on a expedition celebrating the rich character of our region. In doing so, the discerning reader will unearth perhaps the most powerful hidden gem of them all: the key to Greater Western New York’s future success. Click here to learn more about the fascinating stories contain in Chris Carosa’s 50 Hidden Gems of Greater Western New York. Click here to see the book’s trailer and a sneak preview. Would you like to benefit from reading Chris Carosa’s 50 Hidden Gems of Greater Western New York anytime you want? Click here to purchase the Chris Carosa’s 50 Hidden Gems of Greater Western New York directly from Amazon. 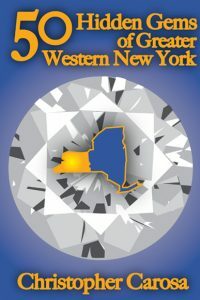 Click here to purchase the Chris Carosa’s 50 Hidden Gems of Greater Western New York directly from Barnes & Noble. Click here to purchase the Chris Carosa’s 50 Hidden Gems of Greater Western New York directly from The Book Depository (free delivery worldwide). Click here to purchase the Chris Carosa’s 50 Hidden Gems of Greater Western New York directly from CEO Read for bulk orders (when available). Click here to purchase the Chris Carosa’s 50 Hidden Gems of Greater Western New York at your nearest retail outlet. Click here to learn more about Christopher Carosa’s 401(k) Fiduciary Solutions. Would you like to benefit from reading Chris Carosa’s 401(k) Fiduciary Solutions anytime you want? 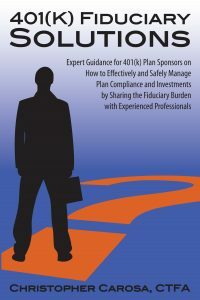 Click here to purchase the Chris Carosa’s 401(k) Fiduciary Solutions directly from Amazon. 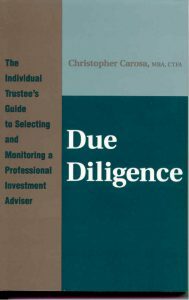 Click here to purchase the Chris Carosa’s 401(k) Fiduciary Solutions directly from Barnes & Noble. Click here to purchase the Chris Carosa’s 401(k) Fiduciary Solutions directly from The Book Depository (free delivery worldwide). Click here to purchase the Chris Carosa’s 401(k) Fiduciary Solutions directly from CEO Read for bulk orders (when available). Click here to purchase the Chris Carosa’s 401(k) Fiduciary Solutions at your nearest retail outlet. The book provides answers to the most critical investment questions individual trustees and fiduciaries might have. This book focuses the reader on converting investment portfolios into tangible and enjoyable activities and events. Many trust attorneys feel the Prudent Investor Act allows individual trustees to reduce their personal liability for investing trust assets by hiring a professional investment adviser in a well documented manner. This book shows the individual trustee how to compile a written record. Four different types of people will enjoy reading this book. Those who role up their sleeves and jump right into things will like the easy-to-read and easy-to-use forms and checklists. Those who like real-life examples will take pleasure from the five case studies detailed in the book. Those who want to really understand the reasons why focusing on one’s lifetime dreams (and not investment performance) relieves anxiety will relish the straight-forward explanations offered in the book. Finally, those who like industry gossip will delight in the revealing inside secrets professional money managers never tell their clients.